There’s a theory that the world can be divided into two kinds of people: those who love chocolate and those who favor citrus. (Shush, all of you that are now protesting that you love both equally. We’re not talking about your children, for heaven’s sake!) Come clean: you’re at Starbucks, treating yourself to a pick-me-up. Which cupcake – the lemony Lazy Daisy or the Death by Chocolate – is going to end up next to your Americano? Make up your mind: Chocolate or Citrus, Ginger or Mary Ann, The Yankees or Whichever Team is Playing Them, Shaken or Stirred, George Bush or Hugo Chavez. Obviously, it’s this diversity of opinion that makes life so very interesting. Right? melt nicely on the tongue – she’s positively passionate about citrus: limes, lemons, grapefruit, along with oranges and all their close kin. 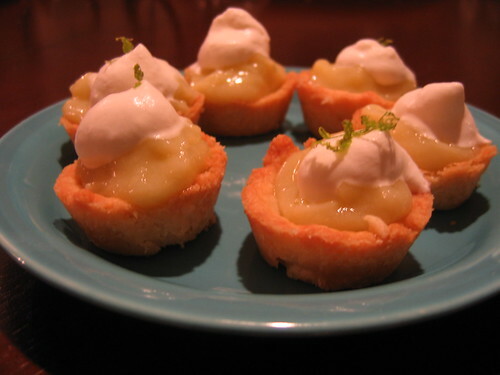 In fact, nothing can make the Queen’s heart flutter faster (aside, perhaps from the King or a new pair of leopard-print pumps) than a dessert that features the sublime lime. So pucker up, citrus fans. This one goes out to you. 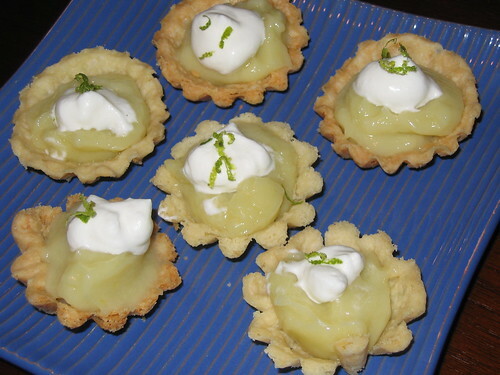 . .
And now for my confession: the tartlet part wasn’t as easy as…well, pie. See, I’ve been dying to use these little tins, a gift from my favorite 12-year-old. But they’re a bit tricky to work with: the crust shrinks in them during baking and afterwards, is prone to crumbling. I tried again – this time pressing the dough into mini-muffin cups. 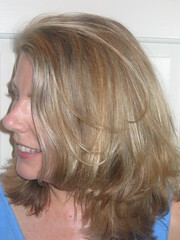 The results were more uniform, if still slightly dowdy. 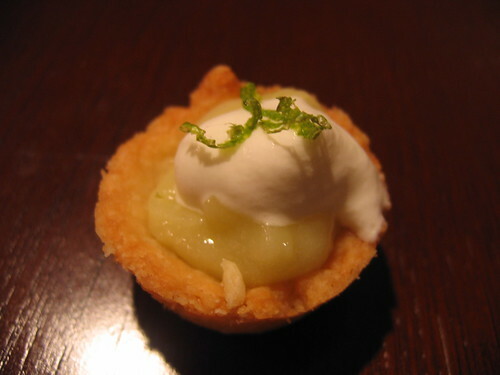 Luckily, though, they tasted divine: the crisp, buttery shortbread a perfect foil for the cool tang of the lime curd. Still, the next time I’ll probably use a 9-inch tart pan with removable bottom. Or better yet. . . I just happened to notice that mini filo-dough tart shells are found in the freezer case at many groceries stores. Just pop them into the oven. There is one good thing about the miniature quality of this dessert: It’s quite easy to deceive yourself into having one (or six) more. They’re just itty-bitty things, after all. Mix together eggs, lime juice, sugar, and butter in saucepan. Stir constantly over medium low heat until mixture is thickened (about 10 minutes). Stir in grated zest. Pour through strainer over medium bowl. Cover and refrigerate several hours. Mix flour, sugar, and salt in bowl of food processor. Add butter and process, pulsing, until mixture is crumbly. Add enough ice water until dough sticks together when pressed lightly. Form into a disk, wrap in plastic, and chill 30 minutes or more. To assemble: Preheat oven to 350. 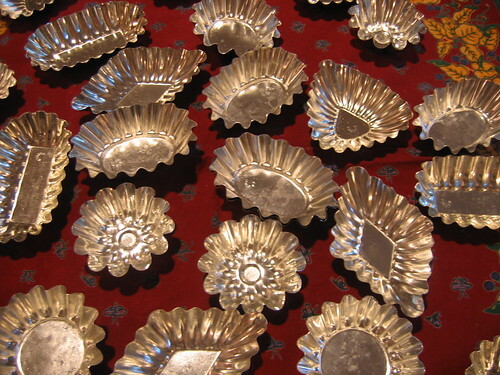 Press tablespoons of dough into mini-muffin tins or tartlet molds. Prick shells with fork and bake 15-20 minutes, or until lightly browned. Cool before filling with lime curd. Garnish with a spot of whipped cream and a bit of zest. Makes at least 2 dozen tartlets. mini filo-dough found in the freezer section of most GROCERY stores??? what happened to the purist in you? I, for one, am utterly and completely shocked! thank goodness we are entering into a period of reflection for the next ten days so that I will have the mind space to ponder just what is going on chez toi...On that note, here's wishing a Happy New Year to all those in the Royal Realm. They look good enough to eat!!! 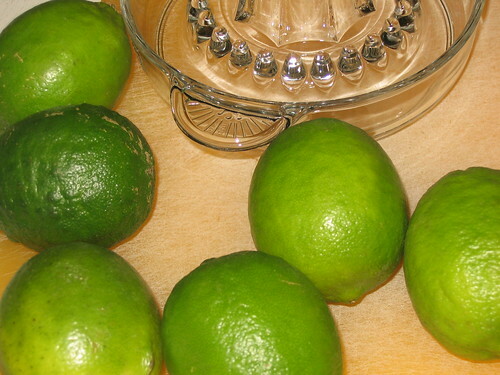 So, speaking of citrus, specifically lime, I've always been curious: is there such a thing as a "key lime", or is "key" just some quirky adjective in "key lime pie"? Dearest Queen- You're loyal readers are snobs. I was thrilled to read your "tip" regarding shells in the freezer section. I think it's far preferable than borrowing cute tart shells from a neighbor and then hurling them at her when the tarts fall apart! I, too, was excited to see a time- and labor-saving tip. Even nobility like myself might not have a lot of extra time to attend to all of the details. Anonymous, I hope the reflecting is going well. I'm saving a tartlet just for you. Currydude, www.keylime.com All you've ever wanted to know and quite possibly, more. Anonymous, The Queen is prepared to duck if hurtling shells are on the horizon. sir markb, All is forgiven. The Early Bird Gets The . . .